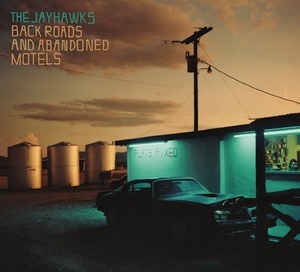 Still finding new ways to refine and expand a beloved sound, the Jayhawks' Back Roads and Abandoned Motels is a triumph. We're enjoying a particularly busy and productive period for the Jayhawks: The band has collaborated with Ray Davies on his two Americana albums, and Back Roads and Abandoned Motels marks the first time since the middle 1990s that we've had two proper Jayhawks releases in the space of three years. 2016's Paging Mr. Proust offered some surprises as Gary Louris experimented with harder-edged songs and a lyrical directness that allowed him to vent sincere anger and frustration with a directness he'd previously obscured. Back Roads and Abandoned Motels might be an even sharper departure from the Jayhawks' business as usual: it presents a collection of songs Louris has written with and for others, now recorded by the band. The exercise in sharing the songwriter's spotlight seems to have inspired Louris to open things up a bit. Where Mr. Proust was guided solely by Louris' explorations, Back Roads might just be the most collaborative album the band has released, with Louris even stepping back from the microphone to share lead vocals with his bandmates. That is not to infer that Louris has been some sort of Billy Corgan-like control freak, but the Jayhawks have long been defined by the twists and turns of Louris' artistic vision, and it is his voice that dominates the band's history. He would be completely justified in maintaining that status quo; that he is demonstrating such democratic flexibility 30 years into the band's career is a measure of his commitment to maintaining relevance and a creative spark. In fact, speaking of the Jayhawks' future with Jedd Beaudoin, Louris emphasizes the importance of change and growth for the band, "I think the goal is to get more of a democracy, more involvement from everybody, get them writing a little bit more. Have me take a step back a bit and quit hogging the spotlight so much.... I'd like them all to kind of step up and I want to see what it feels like." We see the benefits of this philosophy throughout Back Roads and Abandoned Motels. All of the classic signifiers of a Jayhawks album are here -- the sublime harmonies, the folk-rock jangle, the wry takes on relationships, and an eye always tuned to the impermanence of things -- but with Karen Grotberg and Tim O'Reagan each taking lead on two of the album's cuts, the band plays with a looser confidence than they've previously captured in the studio. Most of these songs have been heard in their original recordings. Album opener, "Come Cying to Me", sung by Grotberg, was written with Natalie Maines and appeared on her solo debut Mother. Two other songs here were co-written with Maines and her Dixie Chicks partners and released by that band. The stellar "Everybody Knows" portrays the paranoia and disconnect between one's public and private persona, sung from the troubled, ironic perspective of someone who seeks the spotlight. The song is effective as a reflection upon the challenges Maines faced following her controversial remarks about George W. Bush or, equally but on a smaller scale, as regarding the daily struggles any of us face in these uncertain times where we often find ourselves wearing different faces in different crowds. The closing refrain of "Everybody knows I'm just barely getting by" is one that countless listeners can probably identify with. The other, "Bitter End" sounds infused with some of the passion of Louris' fractured relationship with former bandmate Mark Olsen, though Maines, Maguire, and Robinson no doubt bring their own road-worn experiences to this melancholy reflection on the musician's life. Other highlights include "Bird Never Flies", co-written with New York songwriter Ari Hest, and the barrelhouse ballad "Backwards Women", written with members of the Wild Feathers but not previously recorded. It's a mystery why that band chose not to do the song; it's a great driving with the windows down summer tune about the joys of hanging on the wrong side of the tracks with the wrong kind of people. "Need You Tonight" was written with Kristen Hall and Scott Thomas and features one of Louris' trademarks: crafting dreamy harmonies that mask the bitter medicine of lessons learned from broken relationships. This is one of those, though the relationship here described isn't fully broken, just terminally cracked. Equally deceptive in its harmonic beauty is the Jakob Dylan collaboration "Gonna Be a Darkness", a gut-wrenching song of mortality that exposes a soul-erasing doubt amidst the politeness and pleasantries of the funeral experience. The album closes with two Louris originals, including "Carry You to Safety", a sincere and uncomplicated love song, proof that for all of the darkness he sees in this world, Louris remains in search of light. Still finding new ways to refine and expand a beloved sound, Back Roads and Abandoned Motels is, start to finish, the Jayhawks' most enjoyable record since Rainy Day Music.